After four years of restoration The Tenant House at Shady Spring Farm is available for our guests to enjoy. Step back in time in this charming home located on our family-operated Black Angus cattle farm. Originally built in the 1880s for the resident tenant farmer and his family, the house has been lovingly restored to the 1930s era. Enjoy cooking breakfast in the farmhouse kitchen, with it's 1935 monitor top refrigerator and restored 1911 cast iron electric range on chrome cabriole legs. Use the 1920's oak-cabinet wall telephone with hand-held receiver and brass bells for free local calls. Modern amenities include central heat and air conditioning, high-speed wireless internet access and cable television with built-in DVD player and a selection of DVDs. Slow down a bit, relax, read a book or visit with friends while sitting in the rocking chairs on the broad front porch. The enclosed back porch overlooks a meadow and pasture area and has seating for two - a great place to read in the morning or sip a cup of tea while taking in the beautiful scenery of the Great Cove valley. Each of the three bedrooms has a double bed and is decorated with antiques. We provide all linens - the beds are made and ready for you to snuggle in. We use crisp line-dried linens when weather permits. The beds are dressed with high-loft goose-down comforters on chilly winter nights. In the bathroom you'll find fresh towels, a mahogany sink base with a French waterspout faucet, and a claw-foot bathtub with shower. We invite you to stroll the grounds, explore the farm's 130 acres, and enjoy the fresh country air. Walk our private lane or make use of the two picnic areas on the farm. Ask to feed the dozens of golden trout that call our limestone springhouse and spring waters home. A romantic retreat or great vacation get-away, The Tenant House at Shady Spring Farm awaits you and your family. Come and enjoy. While on the farm there are endless things to do... repairing and maintaining buildings, upkeeping fences and keeping the grass and weeds in check. We're kept company by our dog Max, a fantastic little rescue dog who absolutely loves having the run of the farm. When there is a little spare time we enjoy riding our horses, two of whom are rescues as well. The farm is a treasure: it has been in my husband's family since 1922. We are compelled to share it with others. Hence, The Tenant House was born. While growing up Tony spent his summers here 'helping' to tend the cows, the chickens and the sheep. After 63 years of farming Tony's grandparents were thinking of retiring. 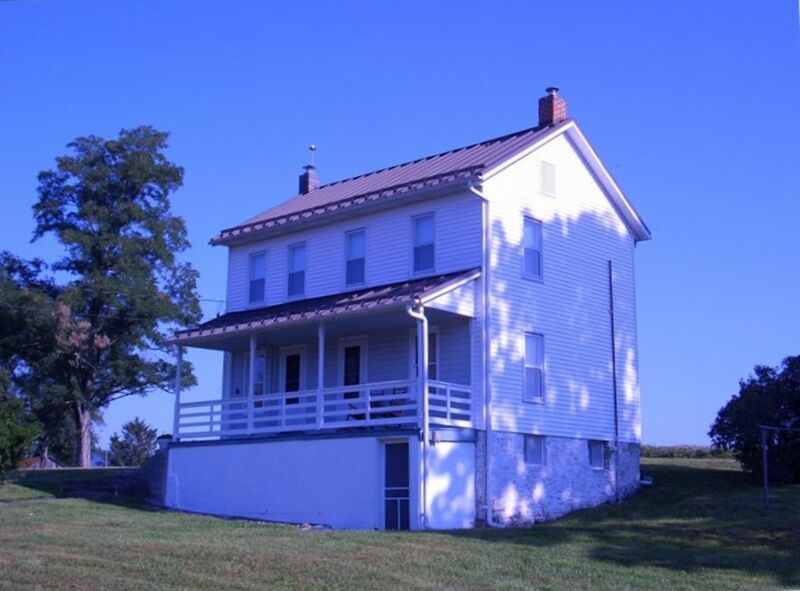 Tony and I were looking to purchase a historical property near Gettysburg - our favorite weekend getaway. The timing couldn't have been better, his grandparents didn't want the farm to be developed and our goal was to restore an old property. One year later we signed the paperwork and purchased the family farm that has been in Tony's family since 1922. Shady Spring Farm feels far removed from the busy I-95 corridor where we travel to our jobs. While it sounds a bit cliche, life on the farm slows down. Every season brings new sights and new scents. Early spring sees daffodils and crocus emerge from thawing ground. April into May is calving season when 80 or so black angus calves are born. May is the first cutting of hay and the blooming of tiger lilies around the springhouse. The warm nights in late June and early July are lit with thousands of fireflies. For two years now we've had both bald eagles and golden eagles visit the farm in the month of July - soaring over the field behind the farmhouse. August is lazy, it seems even the trout in the springhouse take it easy. Every season brings it's own wonder. When Tony wants to play a little golf he heads to the Great Cove Golf Course, just two miles from the farm. Whitetail Ski Resort (with snow tubing!) and historic Berkeley Springs, WV are within 30 minutes. One can enjoy a trolley ride at the Rockhill Trolley Museum in nearby Rockhill Furnace. When in the mood for outlet shopping we have two choices within an hour - Prime Outlets in Hagerstown MD and the outlet center in Gettysburg, PA. Two battlefields are within an hour, Gettysburg and Antietam, and we enjoy visiting both. The washer and dryer are located in the basement, along with a second modern fridge/freezer if needed for overflow. Fully restored 1935 GE monitor top refrigerator in the kitchen. Both a coffee maker for larger brews and a Keurig for single cups. We provide starter coffees and teas. Restored 1938 Sunbeam toaster - although it doesn't pop-up when done it was marketed as "keeping your toast warm until you want it". Use our modern wide-slot toaster for bagels and thicker breads. Place settings for 6 guests. Most comfortable for four but will seat 6. 30 minutes to Whitetail Ski Resort for skiing, tubing and snowboarding. Gear is available rental at the resort. Bring your horses on vacation! We now offer over-night horse stabling in our newly remodeled 1800's hand-hewn bank barn. Four large airy stalls (12x16), sliding doors, automatic waterers. Dry-lot turnout with automatic waterer and grassy paddock also available. Access to 250 acres for riding, or take a day trip to public trails at Gettysburg, Antietam Battlefield, C&O Canal, etc. The farm may be available for small events and weddings on a seasonal basis. Please inquire if interested. While we did not have more than one night at the Tenant Farm, we found it in spotless condition and beautifully restored with lots of historic details. The kitchen -- especially the stove -- was delightful to use. We enjoyed the cozy living room and the comfortable beds. Barbara and Tony were very attentive about staying in touch and welcoming us. Would definitely recommend this property. Great experience! Very easy to access the house. The house is very beautiful and cozy to stay at. We enjoyed staying at this refurbished period house. It has the fun period furniture and appliances and easy to use but blends in modern pieces of furniture for more comfort. Easy to find and kids enjoyed walking the farm. 30 min drive to whitetail for snow fun! Great stay. The comfort of this place was impeccable and the attention to detail was amazing. Thank you to the owners for making our stay amazing and safe by keeping the driveway clear from the snow storm. Very cozy, clean and quaint farmhouse. Maximum of 6 guests including children. 4pm check-in and 11am check-out unless prior arrangements are made. Visa, Master Card and Discover, check and cash accepted when booking with us directly. We do not charge a service fee when you deal directly with us. In the case of a cancellation the deposit may be applied to a future stay. Please contact us for last minute stays of a single night. Due to the historic nature of the house and the sensitivities of some of our guests we can not accept pets. Parties are not permitted.